Barton Rovers turned in one of their best performance in many years as they hammered one of the title favourites Royston Town 6-3 on Tuesday evening. The visitors romped into a 3-0 lead after only 13 lucky minutes with a brace from Connor Calcutt and one from Billy Adcock. Lewis Todd was called into action shortly after as Royston were awarded a penalty and the keeper expertly saved Jack Bradshaw’s spot kick. However, Bradshaw did find the net moments later turning in from close range to give the hosts some hope at 3-1. 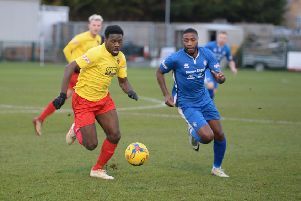 They then pulled another back on 23 mins before Rod Orlando-Young fired home an unstoppable strike at the other end to put Barton 4-2 in front at the break. The second half was played at the same frantic pace with Todd called into action as much as Crows keeper Joe Welch. Barton extended their lead on 74 mins with another wonder goal, this time from Jordan Wynter who gave Welch no chance burying his rocket shot in the top corner. Orlando-Young then popped up to make it 6-2 to Rovers shortly before the end, as Scott Bridges’ late effort was just a consolation. Barton boss Jimmy Gray said: “As impressive performances go that has to rate as one of the best, the lads dug deep and gave everything. Rovers are now up to fifth in the table and visit Aylesbury United on Saturday.